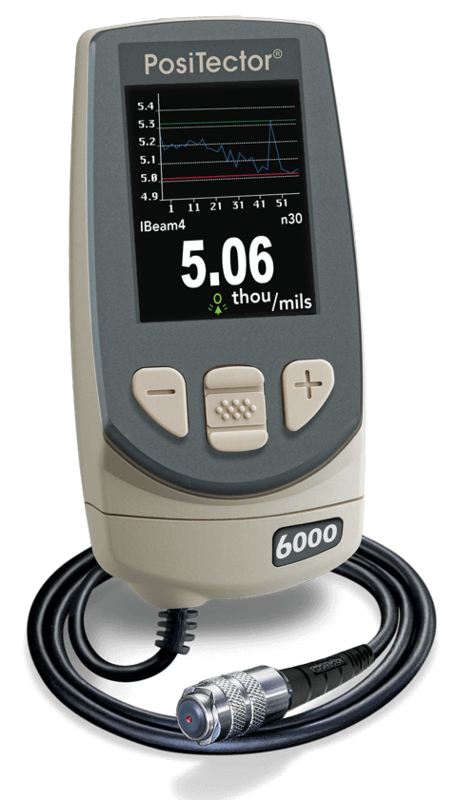 DeFelsko offers many models of the PosiTector 6000 thickness gage that are ideal for measuring the total thickness of intumescent fire resistive coatings. Selection is primarily dependent on the expected coating thickness. 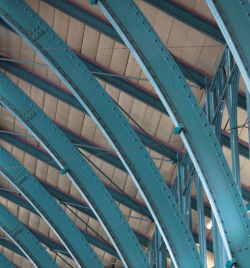 Intumescent fire resistive coatings are applied to steel building supports such as beams, channels, pipes and tubular columns to protect their structural integrity in fires. DeFelsko manufactures hand-held, non-destructive gages that are ideal for measuring the dry film thickness of these coatings and for ensuring that they are applied under ideal conditions. Although steel does not burn, it can be severely weakened when exposed to high temperatures for extended periods, such as in a building fire. It is believed that such damage led to the collapse of the World Trade Centre towers Since the attacks of 9/11, greater attention has been focussed on the development and application of better and more durable intumescent coatings. Intumescent fire resistive coatings generally require a primer for adherence. A decorative/protective topcoat may also be necessary – especially in humid environments. A reinforcing mesh can be used to better retain the char layer on certain shapes. The effectiveness of an intumescent fire resistive coating depends on the coating thickness and its ability to retain the ash layer. Coating thickness typically ranges from 30 to 500 mils (0.8 to 13 mm). The applied thickness must meet the product specifications for the type of structure being coated and the applicable building code requirements (e.g., to withstand a fire of a certain temperature and duration). As intumescent fire resistive coatings can be quite expensive ($4 to $12 per square foot, depending on the application and required rating), measuring the coating thickness can play an important role in controlling the application costs. Proper adhesion is also essential to the effectiveness of these coatings. As the adhesion is strongly affected by the climatic conditions at the time of application, manufacturers generally specify the range of conditions for which their products may be applied – e.g., relative humidity, air temperature and the difference between the surface and dew point temperatures.3 and 4 Therefore, it is important to carefully monitor the climatic conditions when applying intumescent coatings. DeFelsko manufactures gages that are ideally suited for measuring the thickness of intumescent fire resistive coatings and for monitoring the humidity and temperature when they are applied. The PosiTector 6000 FT series are ideal for measuring coating thickness up to 250 mil (6.4 mm). These gages provide results with a maximum accuracy of ± 0.5 mil (0.01 mm) + 1% of reading for measurements less than 100 mil (2.5 mm). For readings over 100 mil (2.5 mm), the accuracy is ± 0.5 mil (0.01 mm) + 3% of the reading. The PosiTector 6000 FKS series is recommended for thicker applications up to 500 mil (13 mm), for which the gages provide results with an accuracy of ± 1 mil (0.02 mm) + 3% of the reading. The PosiTector 6000 FLS series is available for very thick applications up to 1.5 inches (38 mm), with an accuracy of + 0.01 in. (0.2 mm) + 3% of the reading. Downloading the measurements from the PosiTector 6000 is as seamless as storing it to a USB data stick or connecting a USB cable to a computer. These features allow for convenient printing and further analysis on a PC. The data logging and downloading capabilities allow an operator to easily track variations in coating thickness through multiple measurements over large areas. The Advanced models come with wireless WiFi and Bluetooth® connections. See our PosiSoft Solutions page for more information. A detailed brochure can be downloaded here. 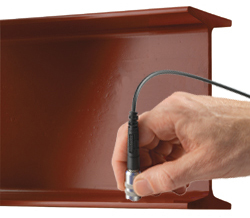 While the AWCI guide notes that coating thickness measurements should be made with a gage approved by the building authority having jurisdiction, it lists only two acceptable measurement techniques: magnetic pull-off gages and magnetic flux-based sensors. The PosiTector 6000 gages use the latter accepted approach. As noted above, intumescent fire resistive coatings should only be applied under ideal ranges of relative humidity and temperature. The PosiTector Dew Point Meter (DPM) measures and records climatic conditions including: relative humidity, air temperature, surface temperature, dew point temperature and the difference between surface and dew point temperatures. The figure below shows the DPM along with the following standard measurements on the LCD display: the % relative humidity (%RH), ambient air temperature (Ta), surface temperature (Ts), dew point temperature (Td), and surface temperature minus dew point temperature (Ts-Td). All five of the climatic conditions are monitored and calculated at the same time and, at the press of a button, the readings can be stored in memory along with the date and time. The DPM also has a unique auto logging feature that automatically records datasets containing all 5 climatic conditions at a user-selected time interval. This is useful for maintaining a complete record of environmental conditions and trends leading up to, during, and after the application of an intumescent coating. For current pricing or to order these instruments, please contact us by e-mail at techsale@defelsko.com, by telephone at (315) 393-4450 or by fax at (315) 393-8471. If you require additional technical information or have questions relating to your particular application, we encourage you to take advantage of our years of experience in recommending the best gage for your needs. 5. 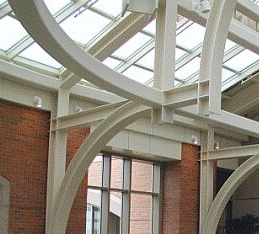 The NFCA represents contractors that install passive fireproofing products to building structures and manufacturers of the products (www.nfca-online.org). The association provides a training program for special inspectors who desire to learn proper inspection and test procedures for the inspection of ... intumescent materials applied to structural steel members. (http://www.nfca-online.org/ICC_Inspector.html). 1. 7. The AWCI represents over 2,200 companies and organizations involved in a variety of building systems – including fireproofing (www.awci.org).